How do you use Simvastatin? Simvastatin (active ingredient simvastatin) belongs to the group of "statins": drugs that lower blood cholesterol and therefore reduce the risk of heart disease. Simvastatin is prescribed for high cholesterol. Sometimes, the drug is used as a precautionary measure in patients who have an increased risk of heart and vascular disease. Simvastatin has to be taken once a day. Preferably do this in the evening: cholesterol is mainly produced by the liver at night. A missed dose can be taken afterward, but no later than eight hours before it is time to take the next dose. 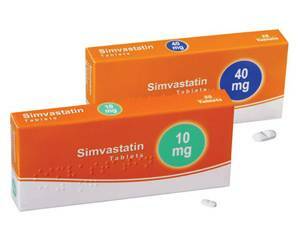 Simvastatin is available in tablets of 10, 20, 40 and 80 mg. The doctor will know which strength is right for you. The usual dose is one tablet per day. However, always follow the advice of a doctor. It can also happen that you experience muscle pain. In that case consult your physician. It may be necessary that you need to switch to another cholesterol reducing drug. Immediately stop using Simvastatin if you experience rare side effects that indicate a severe allergic reaction (swelling of the face and mouth, severe skin rash). In this case, immediately alert a doctor. A complete overview of possible side effects can be found in the leaflet. Simvastatin is not suitable for people who are allergic to simvastatin, or any of the excipients. Also patients who have a liver disease should not take Simvastatin. Furthermore, this drug should not be taken if you are trying to become pregnant, are pregnant or if you are breastfeeding. A full list of contraindications can be found in the leaflet. Many medications interact with Simvastatin (and vice versa). Inform a doctor and / or pharmacist about the medications you are taking. The leaflet shows an overview of the medications that interact with Simvastatin. When using Simvastatin you should not consume grapefruit (juice). Also, the consumption of too much alcohol is not recommended. Moderate your intake of alcoholic beverages. When you use Simvastatin, you may experience dizziness at first. Keep this in mind when you participate in traffic and use machinery. Dizziness will eventually disappear in most cases after prolonged use.